How has your day been? Good I hope? So I have never been a drawer or painter or anything in between that, I have been a crafter who dabbles in mixed media sometimes. So when I decided to do a watercolour project for one of my classes I lost the nerve and thought what on earth are you doing Charley?!?!?! Then I took a breathe and started playing. This is one of my usual cards, 4inch x 6 inch (10cm x 15cm). My layers are 0.5inch (1cm) shorter and narrower. I used the bitty butterfly punch and decorative label bunch. I done some masking to create the scene at the bottom of my card. I simply used sticky notes to cover the parts of the stamp I didn't want or to protect some of my other stamping. This I colour with the watercolour pencils on some whisper white cardstock. My background was on watercolour paper and my base was emerald envy. The white layer between the base and watercolour is also whisper white. I used a combination of blender pens and aqua painters on this card to get the desired effect. I punched the smallest flower from the bunch punch and added some white enamel dots. The bitty butterfly gave some balance to the card. The very bottom I used a stamp from the FREE delicate details stamp set in sale-a-bration. This was coloured in with clear wink of stella. I am just loving this card. In the last autumn/winter catalogue I got the emerald envy thread and used that behind my bird. The pencils I used were yellow, green, blue, brown and black. I think they are fantastic! Great product and I will be buying a few sets to keep me going! 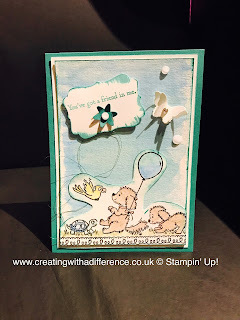 My sentiment is from the bella & friends set and all the inking is with the emerald envy ombre pad. This is from the autumn/winter catalogue as well. I love the ombre pads and I am collecting every colour as and when I see them. They are my weakness along with the tin kits. I think class enjoyed this project, I am trying to give them something difference each week and not just a 'basic' card. Although sometimes simple is the best way to do.